Whitby Pilot Gig 32' 0" 725 lbs. 58 in. 1600 lbs. Prototype Status: Four hulls have been sold. At least three are in use. Pricing: Plywood Parts Kits will start around $3500, Plans TBD. The Whitby Fisherman’s Amateur Rowing Club commissioned this stitch-and-glue rendition of a traditional Cornish pilot gig. 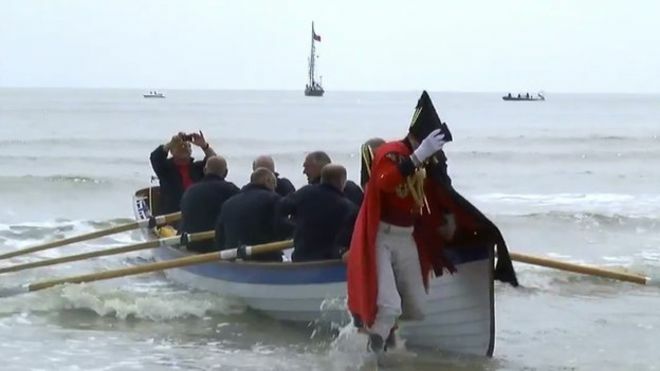 Whitby is in North Yorkshire on England’s east coast, and the club will be racing the six-oared boat against traditional gigs. The design of these fast rowing boats dates well back into the 19th century. No one has ever tried a stitch- and-glue Cornish pilot gig, and at 32 feet long it’s certainly among the largest quick-assembly stitch-and-glue projects out there. We started with the lines of Treffry, built in 1838 and considered the paragon of the type. We adapted CLC’s LapStitch™ system for quick and strong construction by novice builders. Very little in the way of a mold is needed, just a few female cradles during the hull assembly operation. Ten structural bulkheads add great stiffness to the hull and support a variety of fixed rowing seat geometries, depending on the racing ambitions of the crew. Kits for the Whitby Pilot Gig start at $3500 for all of the CNC parts. A total outlay of less than $6000 for a finished boat is achievable. With every part milled out on Chesapeake Light Craft’s CNC equipment, assembly is quick and precise. Puzzle joints speed the joining of 9mm okoume hull planking (12mm for the sheer strake) to full length. The gig is stitched together upright in a simple building cradle for convenience and to ensure accuracy. Then the hull is flipped and the LapStitch™ seams are bonded with epoxy. A modest amount of fiberglass fabric reinforcement is added below the waterline, inside and outside, while all surfaces are sealed with epoxy. With the addition of laminated rails, the structure is rigid, light, and durable. Early trials of the prototype show a wooden pilot gig as elegantly proportioned as the traditional hulls. The boat uses 12'6" sweeps set in thole pins or Concept II locks.